I love video game soundtracks. I also love hearing my favorite video game songs reinterpreted in cool and interesting ways. Late last year, I put together a list of five of my favorite artists who cover video game music and now I’m back with another set of five, this time venturing outside the genres I typically listen to. The Consouls are an Australian jazz band that covers mostly songs from video games, although they’ve done a few covers of songs from film and anime as well. What’s really cool about the music these guys make is that they put a very unique spin on each song they cover, mixing it up with a lot of improvisational bits and slowing down faster tracks into smooth jazz slow jams that would feel right at home in a classy bar in a noir film. SwigglesRP is yet another cover artists who makes rock and metal covers of video game tracks (with the occasional film and television cover thrown in). In the last couple of years, he’s really stepped up his production quality and put together some pretty awesome covers, ranging from rock, to progressive metal, to some pieces of a more ambient or electronic nature. 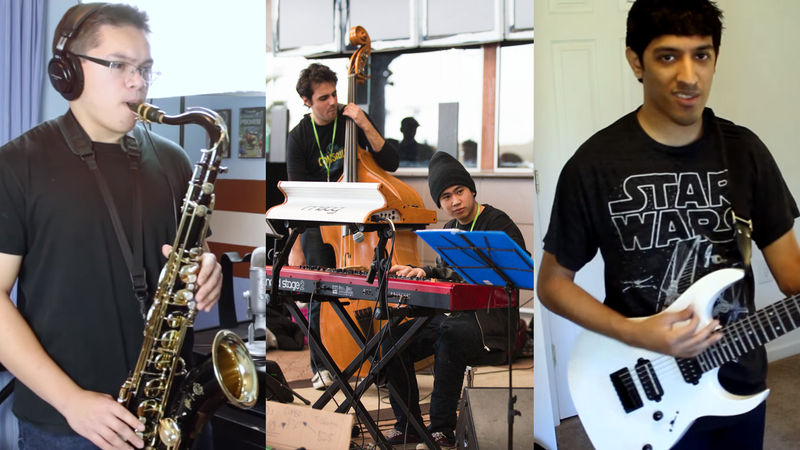 He’s also done a ton of collaborations with other members of the VGM cover community. You’ve probably heard of Smooth McGroove. He’s the guy with the long hair and long beard who makes awesome a cappella covers of video game tracks. The man has an amazing voice with quite the range, hitting both high and low notes like a boss. Each of his covers is made up of several layers of vocal tracks, combined to create a sound almost reminiscent of a chip tune. What I really love is that he uses his voice to create the percussion tracks and mixes things up and throws in some whistling here and there. Ace Waters made a splash last year when he teamed up with RichaadEB (featured on my last list) to create the first official Undertale cover album, Determination. Rich did a bunch of metal covers of the boss fight themes while Ace did a bunch of electronic covers of many of the other songs in the game. What I really like about Ace’s music is that instead of creating the typical dubstep-y covers that most people do, he creates really awesome ambient electronic covers and often incorporates unexpected instruments like a saxophone or a banjo. He also recently started a really cool new “space folk progressive post-metal” band with several other internet musicians, including RichaadEB, called Involved in the Troubles. insaneintherainmusic makes really awesome jazz covers of video game music. His main instrument of choice is the saxophone, but he also plays the piano, the guitar, and a bunch of other instruments. His skill and production quality has only gotten better over the years and he has quickly become one of my favorite VGM cover artists. Earlier this year, he released an official Undertale Jazz album called Live at Grillby’s, which features some of his best work to date. He’s also been on a roll with a series of covers of songs from the fourth generation Pokemon games over the last few weeks. His musicianship is just flat out amazing and he never fails to impress. That’s it for this list, but be sure to share your favorite VGM cover artists below. I might even feature them in a future article.